When it comes to dietary supplements, many consumers think of vitamin pills or tasteless protein shakes for bodybuilders. But the start-up Huel proves that dietary supplements can also be balanced, fast-acting and, above all, healthy. The international team produces “healthy nutrition in powder form”, which is very much in line with current trends. This was reason enough for us to interview James McMaster about the concept and its advantages. Huel is a nutritionally complete food in powder form, which means it contains everything the body needs for a healthy diet. It contains a balanced mix of carbohydrates, fats, proteins, vitamins and minerals. How did the idea for Huel come about? 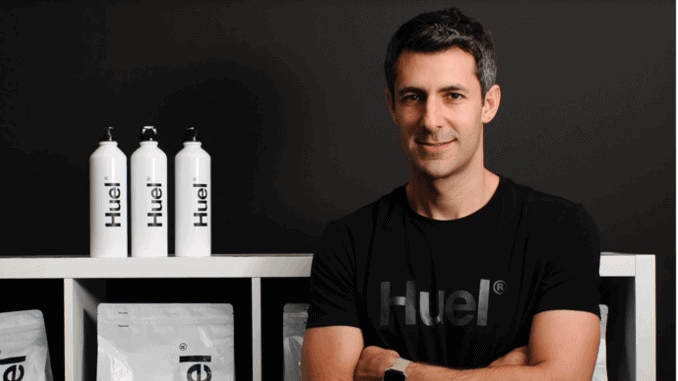 The idea for Huel came to our founder Julian Hearn whilst he was playing sports. He used protein shakes to support his training. At one point, he came up with the idea that a shake could also make everyday life easier by providing a snack for in between meals which is both easy to prepare and good for the body. What distinguishes Huel from other dietary supplements such as vegan protein powder? Protein powder, as the name suggests, contains mainly proteins and is often used to support muscle building. Huel, on the other hand, provides the body with everything it needs. It is therefore a healthy substitute for fast food. Our team currently consists of 65 people working internationally in Berlin, London and Los Angeles. We are already the market leader in Europe. At the beginning of the month, we raised an investment of 22 million euros through Highland Europe, and want to rapidly speed up our expansion to become the global market leader. Huel has already achieved a global turnover of 50 million euros through self-financing. Which sales channels do you use for marketing? We currently only sell Huel online through our own shop – smaller quantities are also sold on Amazon. It is important to us to offer our product to our customers as cheaply as possible. With direct sales, many intermediate stages and costs can be eliminated. How do you perceive the market for vegan supplements? Due to the ever-growing population, it is politically and ethically unacceptable to eat a non-vegan diet. In addition, people have less and less time to devote to healthy eating. Vegan food supplements therefore meet the demands of the time. Are vegans an important target group for you? Of course. We believe that vegan nutrition is the nutrition of the future, so vegans are absolutely our target group and all our products are vegan. Why is Huel just right for a vegan diet? Huel is vegan, and an ideal snack for in between meals. For vegans who often don’t have time to cook, Huel is the ideal solution for a balanced and wholesome diet. A new product is coming soon which will make Huel even more practical. Unfortunately, I can’t tell you about it yet. But you will be the first to know about it. Where do you expect Huel to be in five years’ time? In five years’ time, Huel will be an integral part of everyday diets globally.